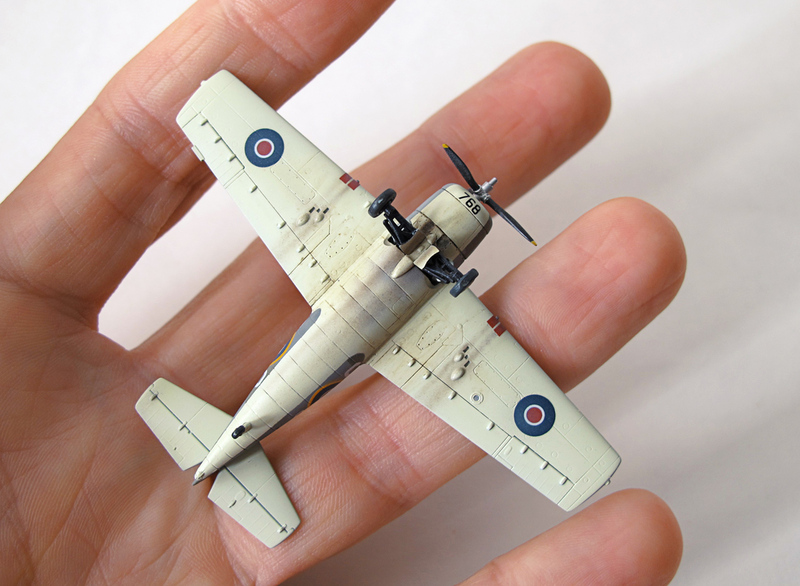 Here you can find several photographs of my freshly finished Martlet VI in 1/144 scale from SWEET. 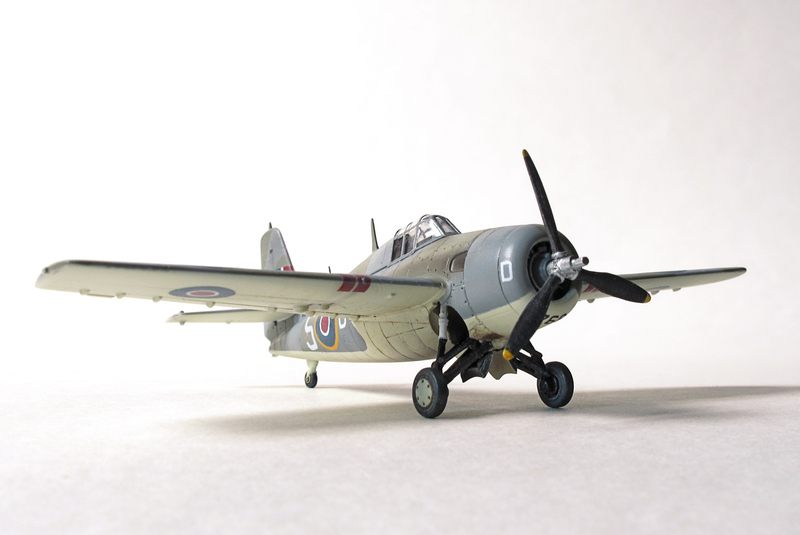 Building of this kit was – thanks to SWEET – really a pleasure. Everything went together well and no filler was needed. SWEET is simply really sweet! 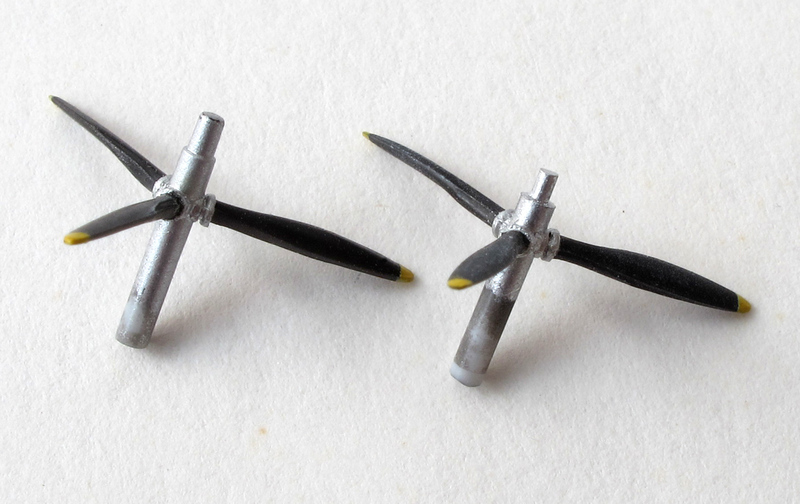 The tiny gaps between connected kit parts have been treated using Mr Surfacer 500 – applied by a very thin brush. After drying, the surfacer excess was removed using a cotton bud dipped into IPA (Isopropylalcohol). Then came Mr Surfacer 1000 and very gentle water sanding to achieve smooth shiny surface for airbrushing the camouflage colours – for also the tiniest dust and hairs are terribly “large” in this scale. 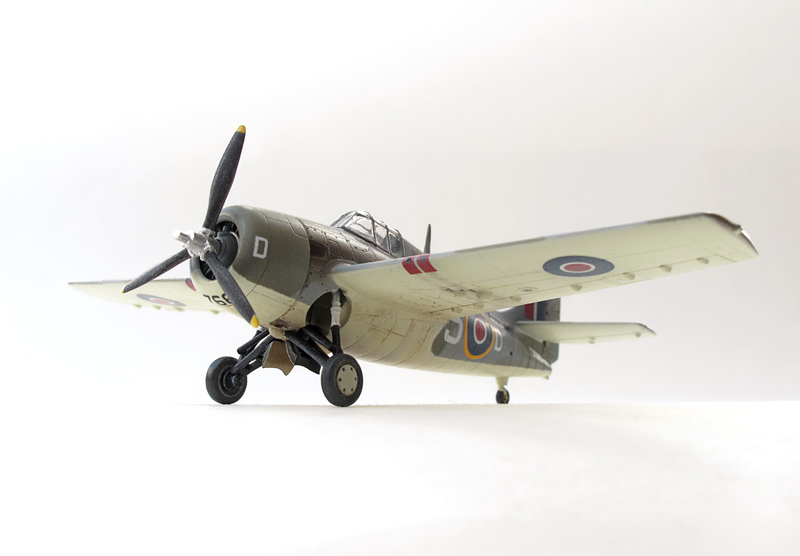 A small aerial was added on the fuselage top made from a black plastic thread (the plastic parts frame was heated on a kitchen stove, then slimmed by dragging its ends apart). The radio mast was made relatively thick by the manufacturer, so it needed to be carefully slimmed. It is attached to a small base of plastic, so it is easy to handle (part No. 10 – pls. see the Instruction plan scan below). You will probably need to use several drops of Mr Surfacer 500 after gluing the radio mast into the fuselage. Gunze Mr. Color # 364, Aircraft Gray Green BS283 was used as the interior colour. The visible gap in the pilots seat area (where the fuselage parts are connecting) was covered by home-made decal bar of the same interior colour – much more easier way as to putty it out in such a small space. The main instrument panel area and the pilot head-rest are matt black. That part of the fuselage which is covered by the canopy front shield is dark gray – a bit darker than the outer camouflage colour. However the Canopy “glass” is so thick and the cockpit so small, that nearly nothing is visible deeper inside it. The camouflage was made according to the instructions found within the SWEET Martlet kit. 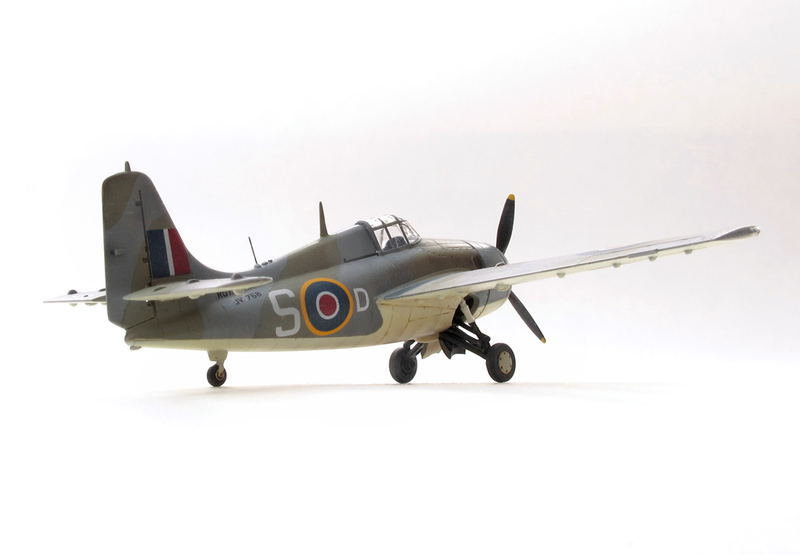 No I. scheme was chosen which is JV768 / S • D, No 882 Sqn, HMS Searcher, Northen Norway from March 26 1945. The instruction plan was not in scale (it was smaller), so it needed to be scanned, enlarged into scale precisely using a PC and printed for preparing the masks. 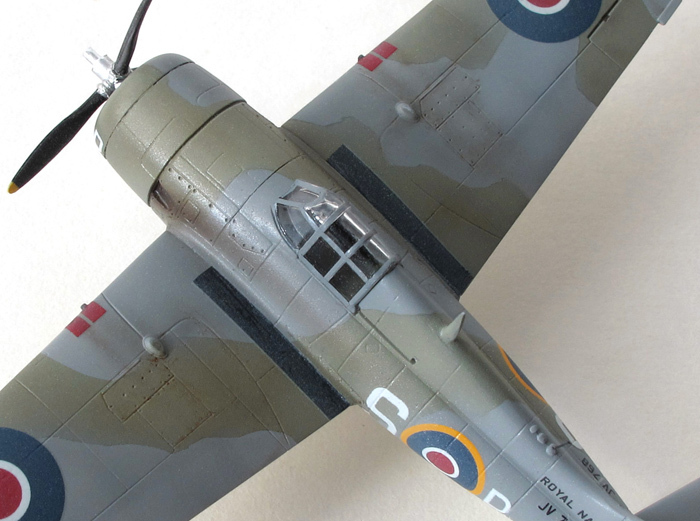 TAMIYA masking tape was used plus a fine pointed cutter – very easy, quick and cheap method. PLEASE NOTE: It seems it is quite hard to precisely define the camo colours of these Eastern Aircraft FM-2 Wildcats i.e. 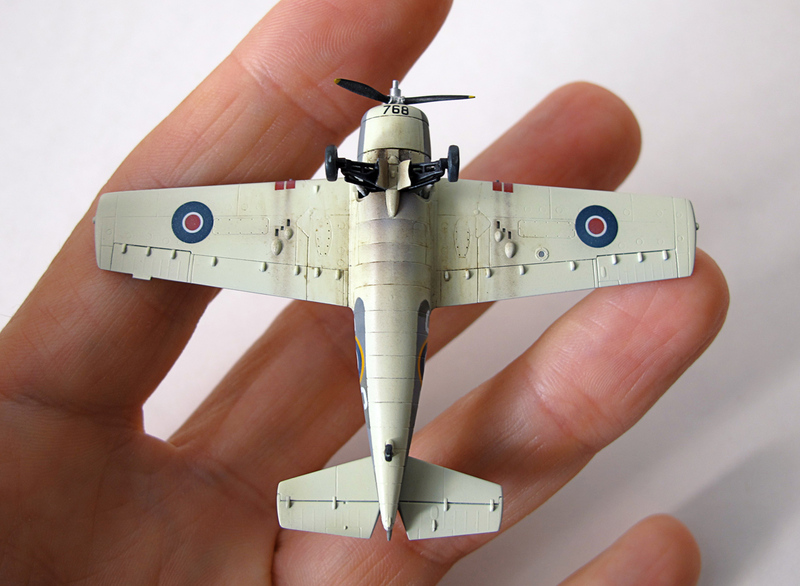 Martlet VI airplanes. 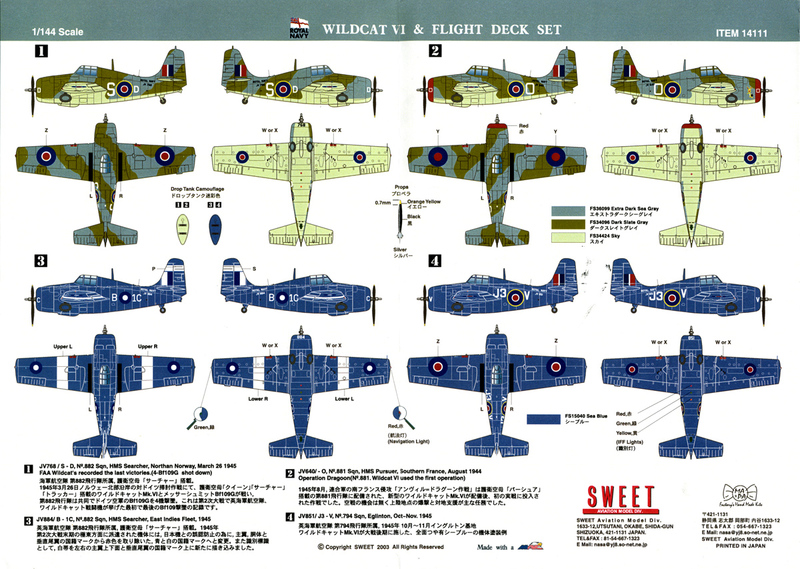 Reportedly the older Grumman Wildcat/Martlet versions built for Royal Navy were painted using colours which were very close to the British shades, but Mk. VI Martlets were not. As some sources indicate, Mk. 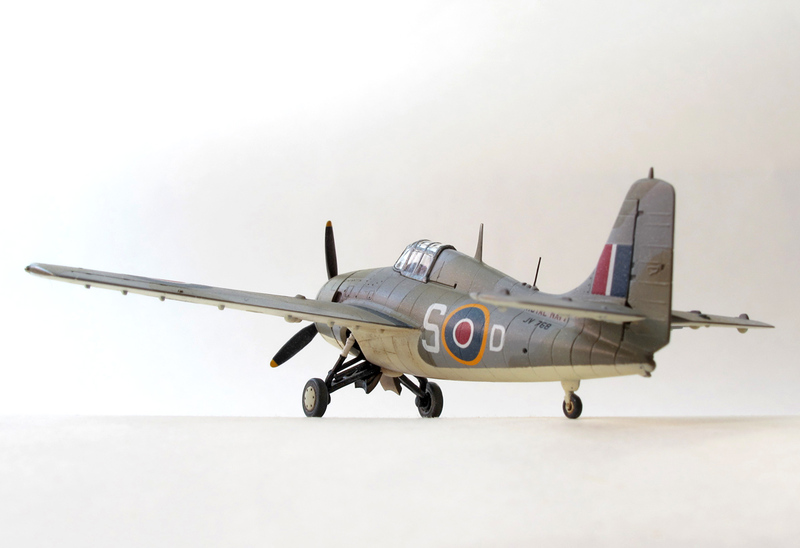 VI Martlets were painted with US ANA Substitute Scheme of Olive Drab, Sea Grey and Light Grey that were very close, if not identical with Extra Dark Sea Grey, Dark Slate Grey and Sky (the British FAA standards). However some of the Eastern Martlets may have been repainted lately during their FAA service with original British colours (but probably not all of them). All the camouflage colours were lightened by adding drops of white colour. 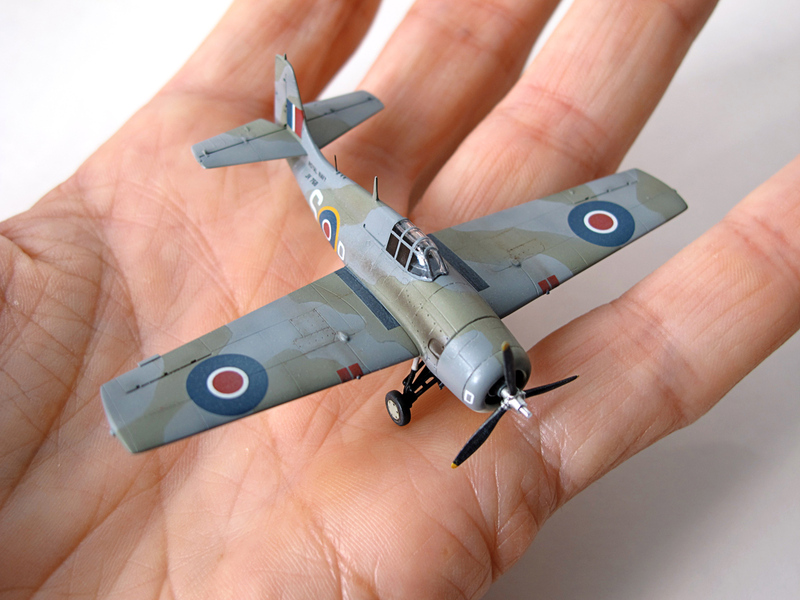 Because the kit is in a very small scale it is better to lighten the colours more intensively – it would look too dark and lacking in details otherwise. You have to rely upon your feeling here. Do not be afraid to overpronounce lightening – the patina will darken colours slightly. Original CARTOGRAF decals were used. They are of high quality and very thin, with excellent colors and registration. Lerge decals and walkway bars were oversprayed with a light mist of camouflage colour mixed with white – to lower the contrast between decals and camouflage and to simulate the sun fade-out effect too. I tried to make the upper camo. colours slightly irregular by airbrushing tiny darker (non-lightened colour) spots and lines onto lightened base colours. The final lacquer coats suppressed this effect markedly but something remained. It is hard to find the proper amount especially in this scale. The exhaust stains were airbrushed with matt Lt. gray and Dk. brown – gun stains with Dk. brown only. The kit got the Mr. Color Super Clear gloss coat as the unifying base for weathering mix of brown (Burnt Sienna) plus black oil color diluted in Mig’s Thinner for washes. Some of the panel lines were tinted – aileron hinges, wing gun bay covers, underwing maintenace covers and central fuselage panels. The overall homogenous semigloss shine was achieved by Mr. Color Super Clear Matt but applyed very subtly. 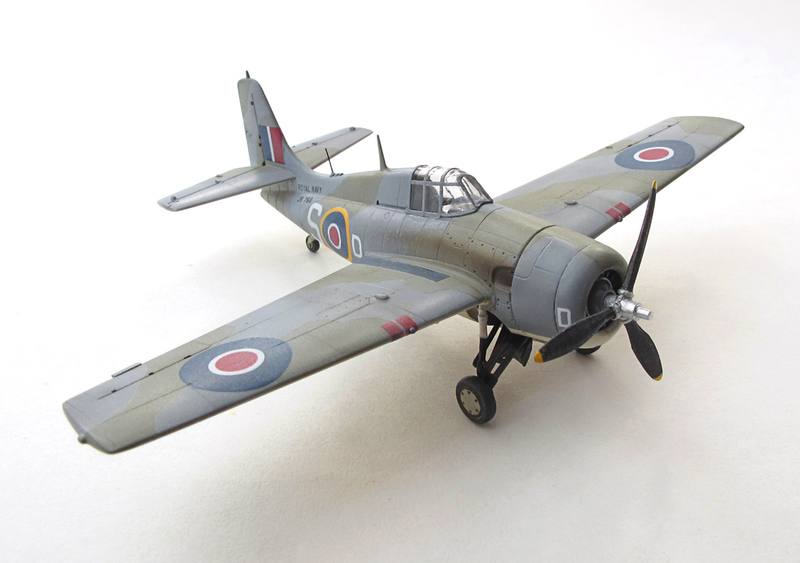 This is the box cover picture of FAA JV768 / S • D Martlet VI in flight. 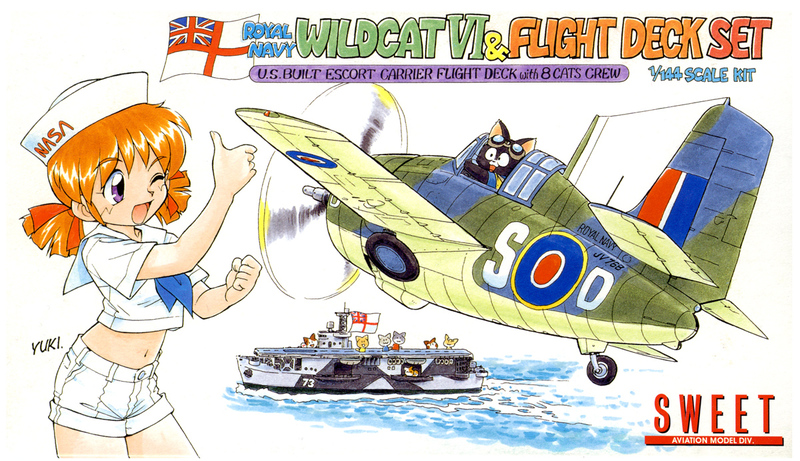 Eight little cats crew, wheel chocks and the flight deck is included in this kit too. 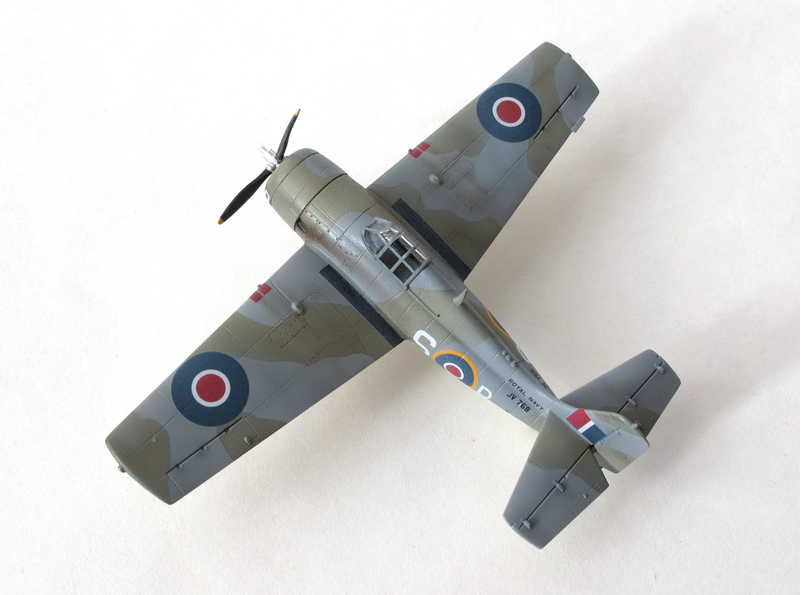 For more finished model-kits please see the Built Kits category. If you enjoyed this post, I’d be very grateful if you’d help it spread by sharing it on Facebook. Model, Images and Text Copyright © 2012 by Marcel Meres. 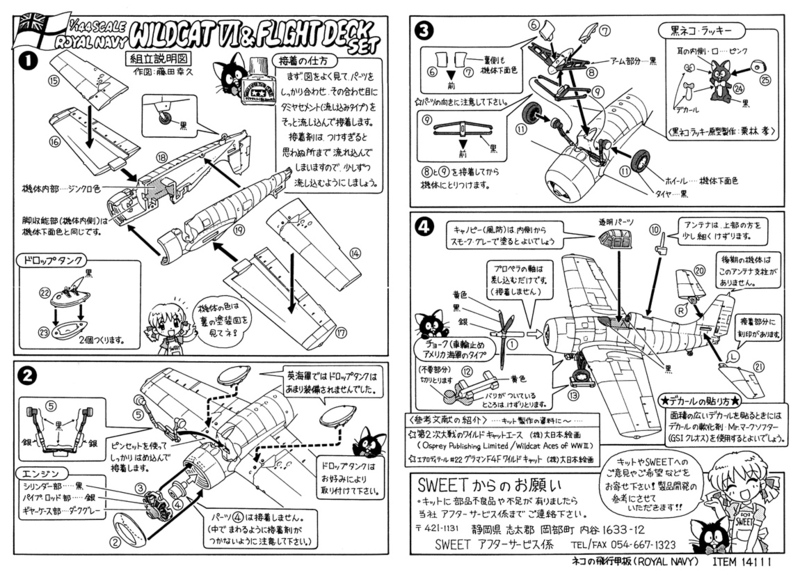 This entry was posted in Airplanes, Built Kits, English. Bookmark the permalink. Velice fešný cvrček. Ozaj nádherný kúsok. Je vidieť, že je za tým veľa poctivej roboty. Odo mňa máš dva krát po desať bodov, ako pri krasokorčulovaní.